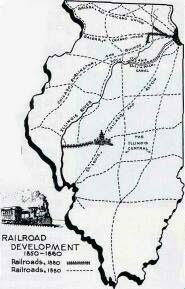 Geology and geography were and are the most important factors in the development of Illinois' transportation system. Four prehistoric glaciers that occurred over a period of thousands of years covered the state, creating both the rivers and lakes that were traveled by the earliest explorers, as well as Illinois' celebrated flat surface, which was later traversed by roads and railroads. In the twentieth century Illinoisians first rose above the rich prairie soil in experimental aircraft. Aviation technology changed, regular airline routes were devised, and municipal airports were constructed. In 1673 the French explorer Louis Jolliet and Father Jacques Marquette, a Jesuit priest and missionary, traveled via canoe down the Mississippi River in search of an outlet to the Pacific Ocean. Although the expedition failed to find this route, later settlers used the Ohio and the Mississippi to reach Illinois from the south, establishing towns in the southern region of the state. The Erie Canal, completed in 1825, allowed direct travel from New England to the northern region via the Great Lakes, bringing Illinois much closer to eastern and foreign markets than the all-water route down the Mississippi to New Orleans. This increased traffic in people and goods around Chicago also meant that settlement patterns began to shift to northern Illinois. North and south, early settlement in Illinois stayed near the rivers and streams. Later migrants moved out onto the prairie, following Indian and buffalo trails through the tall prairie grass and marshy swampland. In the 1830s technological developments in farming and a dawning awareness of the prairie's fertility pulled settlers onto the broad prairie. Early settlers found it difficult to travel within the state because it lacked even rudimentary roads. As the population increased and improved farming methods resulted in increased yields, there was a demand for better ways to move people and products from farm to market. In 1836 the Illinois General Assembly responded with the Internal Improvements Act of 1837, which provided for construction of the Illinois and Michigan Canal. The canal, completed in 1848, created an inland water route that connected Chicago to the Gulf of Mexico. The following year the General Assembly turned its attention to newer technology—the railroad. Congress provided land for a Y-shaped rail line from Cairo to East Dubuque, with a branch to Chicago. 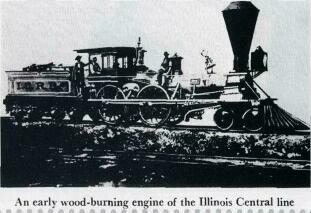 Entrepreneurs worked hand-in-hand with government officials to establish the Illinois Central Railroad and to bring other railroads to Illinois. Trains soon became the primary method of transport for both people and freight. Trains conveniently stopped at each town, sparing rail travelers from muddy and often impassable roads. Throughout the early nineteenth century, political leaders in Illinois encouraged the development of "internal improvements," a term that then meant railroads and canals. They wisely foresaw that the development of the state depended upon transportation, but their financing; methods were all too often unwise. 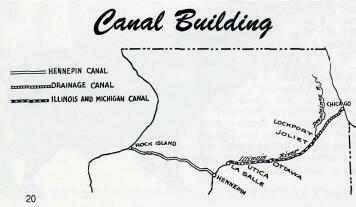 The first of these great internal improvements was the Illinois and Michigan Canal, begun in 1836. Chicago's favorable geographic location and expanding industrial base after the Civil War proved to be the key factors in making it the most important railroad hub in the nation, a distinction the city retains to the present day. Railroads played the most important part in the distribution of goods between the vast region to the west of the Mississippi and the eastern half of the United States. By the 1870s the only problem relating to rail transport was connecting rural parts of the state to towns served by rail lines. Nevertheless, by the end of the century, a national, regional, and an inter-urban rail network crisscrossed the state. The construction of adequate roads to reach the railroads began in the late 1880s, when stone and gravel roads were financed and constructed by a combination of subscription and community labor. In the early 1900s individual entrepreneurs and communities built paved roads. In 1916 the national government provided matching funds to state highway departments. This policy spurred the development of automobile highway construction in Illinois. For example, Route 4 from Chicago, cutting a diagonal path across Illinois on its way to St. Louis and points west, was the paved forerunner of Route 66; it closely followed the Chicago and Alton Railroad tracks. By 1926 the federal highway system received support in an annual appropriation, allowing for the construction of Route 66, an all-weather road which began in Chicago and ended in southern California. Later, during the Depression, more federal grants for road construction and improvements provided work and helped the economy. Finally, the Federal Aid Highway Act of 1956 resulted in replacement of two-and four-lane highways by interstates. It was now less expensive to ship by road in large trucks than by freight trains, which became less frequent in number and served fewer communities as a result. In addition, since many families had their own automobiles in the 1950s, fewer used public transportation, including passenger trains, to cover long distances. Air travel became a possibility in 1890 when Octave Chanute, a Chicago engineer, designed a biplane. It was the model studied by the Wright Brothers before they made the first powered flight at Kitty Hawk, North Carolina, in 1903. Early planes were used primarily for barnstorming and exhibition purposes. In 1918 United States Airmail service began between Chicago and New York, and by 1926 four airlines served Chicago. Although airline expansion continued during the Depression, after World War II new major lines developed and existing routes were expanded. Like early canal and road-building schemes, the early airports were mostly private ventures. Many did not survive the Depression. All over the state, however, municipalities stepped in to reopen, maintain, and expand local airstrips and airports. Chicago's Municipal Airport, later renamed Midway, was dedicated in 1927, with only a single runway. It quickly expanded, becoming in the 1940s the world's busiest airport. Soon it was superceded by Orchard Airport. Later renamed O'Hare, after a local flyer killed in World War II, it quickly grew and today claims the distinction of "the busiest airport in the world." Midway Airport modernized in the 1980s and remains an important link in the nation's transportation network. Regional airports include the Quad Cities, Peoria, and Bloomington-Normal, which is now the second-fastest growing airport in the United States. Transportation in Illinois—a state rich in natural resources and agricultural products—has evolved from the earliest days of travel by waterways, rough trails, and rudimentary roads to travel by railroads, ever-improving paved roads, and air travel. Thanks to the glaciers and the continually evolving transportation system, Illinoisians and their agricultural and manufactured products today have access to national and international markets.